For Claude Zellweger, the design executive on the new HTC 10, good design tells a story. And coming off of previous successes, like the HTC One M series of flagship smartphones, as well as the recent release of the HTC Vive, it's clear that he and his team know a thing or two about telling a pretty good one. And Zellweger's latest story starts with the HTC 10's most striking visual feature: the thick, chamfered bezel that wraps around the phone. Phones are shaped and molded by robots in a factory, but the story behind this bit of design flair is surprisingly human. As Zellweger runs his finger slowly around the chamfered bezel, he shares "I had my design team look for inspiration way outside of consumer electronics. A few of us surf on the weekends, and we love surfboards and the way they're shaped. There's something about feeling them, you can really feel the hand of the shaper." "Even though this is done with a robotic arm," he continued. "There's a lot of craft that goes into teaching the robot how to do that because it [the chamfered edge] is cut by a single stroke. It took countless hours for it to be done flawlessly, because even the slightest movement would mean we'd have to throw it away." Creating the HTC 10's signature edges didn't just take hours of machine training, there were many more mockups beyond the final design we see today. 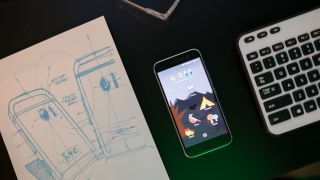 "I just recently saw the mockups for the HTC 10 and I was just floored by how many [prototypes] we did," he teased. "Some of the crazier stuff...you know what, I don't really want to talk about that. Some of it, you may see in the future." In finalizing the design of the phone with its internal engineering, he said that "there's a number of mockups that present what we want to do to the engineering team." "There's a ton of back and forth until we can fit all of the components inside, " he continues. "Then, there's a lot more just to do the details, which take the same amount [of work] or even more." HTC made a name for itself with with the very first Nexus phone, and the HTC One M7 and HTC One M8 cemented the Taiwanese company's already-solid foundation. However, last year's HTC One M9 failed to make a similar, booming impression as its predecessors. We were looking for something new in the M9, and didn't see the bold divergence from the One series path. To ensure that HTC's latest phone would be its best yet, Zellweger sides with the users, saying that "it's critical to listen to what people say because it informs what we do." Once you have that user input, you can just get right to work, right? Not quite. As he states, that's a big part of it, "you have to absorb that information, absorb all of the recent technical innovations, too, and put it together in your mind." As a designer, just like any creative field where you have to simultaneously balance expectations and push the bar, actually creating the phone required Zellweger and his team to "then forget about everything." "Intuition kicks in. You create the future you want and in doing that, you can't always follow what the people want. In general, what people want is a more feature and spec-driven device. What we try to add to that is to move the design as a whole toward what people will want in the future." But the HTC design team is fully aware of what has worked in the past. The latest phone sends a wink back to the 2013 hit HTC One M7, but reimagines its best qualities for the modern age. "I'd be lying if I said that we didn't pay a little homage to the M7," Zellweger confessed. "We really liked it at the time, but there were a lot of things we couldn't do with the M7's antennae and technology." "What we liked about the M7 is the crispness to it, but you see that there's a lot more plastic." He continued. "The 10 is crisp and uncompromising with the metal." Zellweger noted there are fewer parts in HTC's latest handset thanks to being able to remove the gasket that holds the glass to the metal. This effectively makes the HTC 10 a two-part phone. The HTC 10 is a blend of old and new. Nodding to the company's previous innovations while forging ahead. The all-metal design of its backside calls back to the HTC One M7, but that's not the only tip of the hat: ultrapixel tech is back in the HTC 10. The HTC One M9 went with a more standard 20MP sensor, while retaining ultrapixel in its front-facing camera. But Zellweger wanted it to return to HTC's flagship line, insisting "I've always been a huge proponent of ultrapixel, as a photographer myself, knowing that it's not just the megapixels that count. The ultrapixel has just always performed better." As for why it didn't make the cut last year, he stated that "there were some market realities about having a certain amount of pixels and I think last year, we just couldn't get there with the ultrapixel camera [in the M9]. But this year, we managed to give you more pixels." The HTC 10 is a smartphone packed with impressive components and runs the latest Android 6.0 Marshmallow software. Those bits of info are public and well-known. But I wanted to know if Zellweger could tell me something about the HTC 10 that only a few people knew about. For the HTC 10, Zellweger's ambition was fixed on "certain parts of the phone that we wanted to make disappear. We have these elements, the USB-C port, the camera location, the audio jack, and as it turns out, they're all completely symmetrical. It seems like a very obvious thing to do. It's symmetrical, it looks good." That design goal was eventually realized, but not without argument with HTC's engineers. "There were countless hours [spent] and arguments like "No, they have to be in the center. It'd be much easier to have them [the components] off-center for everybody.," Zellweger expounded. "But no, it has to be in the center." It's easy on the eyes." Of course, Zellweger and his team are celebrating the launch of the HTC 10, but my mind is on the future of smartphones, modular ones, in particular. The concept of modular smartphones is endlessly fascinating to me, but the challenges of actually bringing one to mass market has prevented them from becoming a mainstream reality. Sure, the Fairphone 2 and LG G5 gave it a try, but my mind always goes straight to Project Ara, the Google-backed project that promised a limitlessly-customizable Android phone. Claude told me "Modularity is one of those things where I want to like it because I'm a designer and I like innovation and ingenuity. Without getting specific, we at HTC consider a wide range of things for our phones." "The reason that I'm going to bet on the all-in-one, seamless shape is it's just the way people use these phones. You don't want to think about what you're doing with the phone in the morning when you leave the house. You want everything onboard." Zellweger believes in the dream, but when it comes to making it a reality, he said that "the whole idea that you can outfit your phone with different components, in theory, is great. But, in practice, it's more of a challenge." No matter the challenge, telling a story for Zellweger and his team of all-stars at HTC, is "always the ultimate goal. Now, with smartphones, the stories are harder to tell because the playing room is smaller. But that's what we want to do every time. And the HTC 10 tells more of a story than any of our previous devices."